we are not the professionals. we do not arrive back at the ranch after 260 kilometres sporting an average 43kph on the garmin. unless our better halves are of a particularly favourable disposition, we do not have a team car following in our wake(s) and you can shout at mavic as much as you like, but they're probably not going to offer neutral service for the sunday morning ride, whether you bought a new pair of ksyriums or not. and i can crane my neck all i want, but so far, neither fausto pinarello, nor ernesto colnago have been seen arriving in the car park, keen to foist team bikes on my bike shed. sadly, it doesn't end there. though the mighty dave t maintains that a fictitious home help cleans his bike till he can see his face in it, it's not what you'd call a regular feature. and though i melodramatically creak from the armchair, mrs washingmachinepost has yet to offer a leg massage to ease the aches and pains of a saturday in the wild. but, as i stated in my opening sentence, we are not professionals; we ride our bikes either because we love it so much, or we're totally bonkers. perhaps a bit of both. and boy do we enjoy it. yet, despite our tacit acknowledgment of all the above, we still want to have the same bike as peter sagan, the same jersey as nairo quintana and the same masseur as vincenzo nibali. because, as we are continually told, cycling is one of the few sports where, assuming you have a suitable depth of pocket, you too can be a professional lookalike. only the speed will be missing. however, none of our deficiencies ought to stand in the way of our desires, particularly when at least some of the above items are well within our grasp. and even if you'd really rather not become a mobile billboard for some obscure european corporation, despite the often marked differences between their stuff and our stuff, there's at least one cycling apparel purveyor north of the border which offers the same kit to the amateur as to alejandro and the boys. 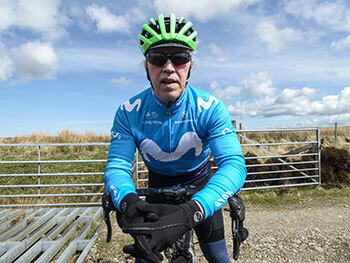 but if there's a perceivable problem in wearing an endura-made 2018 movistar cycle jersey, it's the conflict between advertising spain's mobile phone companies (including o2) and canyon bikes versus the fact that this year's colour scheme is pretty darned brilliant (in both definitions of that word). i'm not sure whose idea it was to fade that pastel cyan into a black that matches any bibshorts you care to mention (in this case, a pair of endura pro sl with a narrow pad), but i'd like to recommend that they get a pay rise. naturally enough, endura offer less visible long-sleeve jerseys, but logos or not, this is a doozy. in keeping with its spanish affiliations, the movistar jersey is constructed from a high-stretch insulated spanish-made grid fleece and though livingston assures me that it features an ergonomic, athletic race fit, this is a deal less onerous to the out-of-shape weekender than can be the case with other apparel providers. yes, it's a close fit and yes, it feels better on the bike than off, but nonetheless, it's pretty darned ginger peachy according to my opinion (as richard sachs would say). even in chilly weather, wear it atop a long-sleeve baselayer and the world (or at least, a bit of the hebrides) is your oyster. if, like me, your average speed has crept significantly above 26kph (probably an administrative error), any internal cooking can be instantly ameliorated by lowering the full length zip from its cosy mid-height collar. and if, like me, you have stuffed all manner of whatnots in those capacious rear pockets, the jersey's stretch and flexibility means that neither long-sleeve will hamper you fishing one or t'other from their depths. i'm not normally one who succumbs to the attractions of team kit, particularly one that blatantly (yet attractively) encourages use of mobile phone networks. still bereft of a smartphone as i am, this would appear something of a velocipedinal contradiction, but it's a stunning piece of scottish-made kit, exactly the same as nairo's and it has long sleeves. 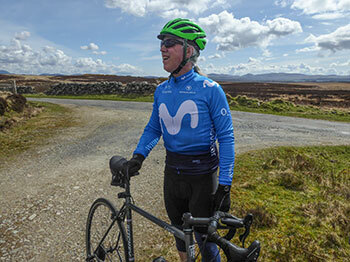 the endura team movistar l/s jersey is currently available in sizes xs and medium at a retail price of £79.99.